A Flotron Engineered Manual Composite Layup Lift and Rotation fixture was implemented to support the upper and lower fuselage halves that were originally resting on the floor in this application. Operators were bending over and were literally on their hands and knees reaching to perform their daily process. 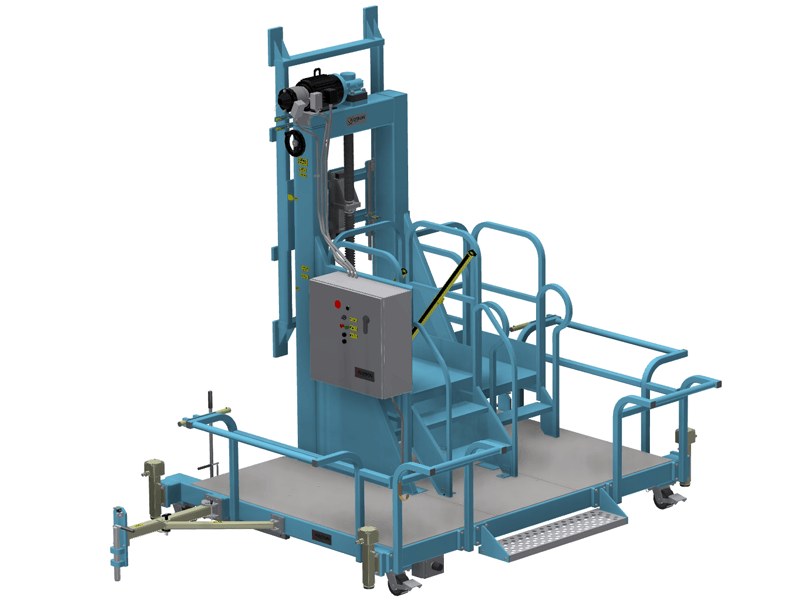 This Flotron Custom Solution was designed to lift and rotate the long composite payload to minimize workplace injuries and potential damage to high value flight hardware, provide access through ergonomic rotation, and maximize production throughput. 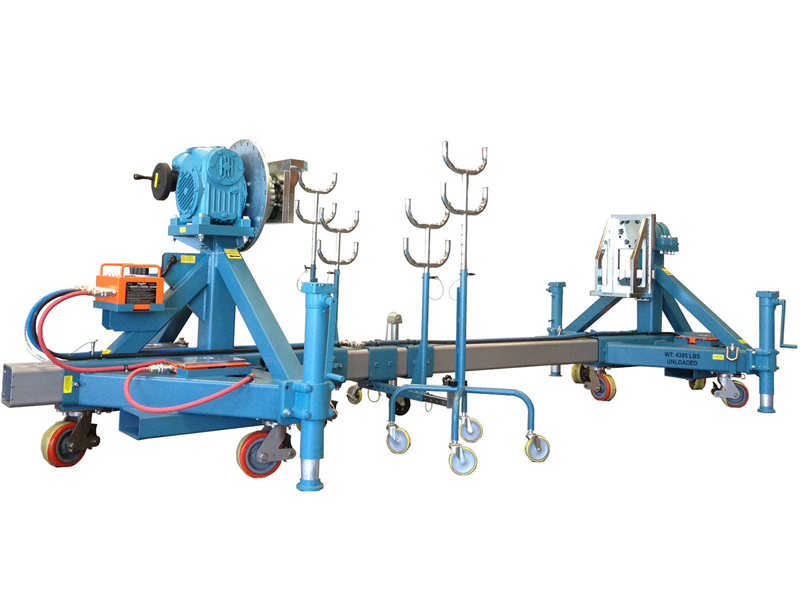 A low backlash gearbox provides the rotational functionality and two independent end frames support the payload and lift it with unsynchronized hand-crank rack and pinion lift jacks. The couplings allow for angular misalignment. One of the end frames of this turnover fixture is bolted to the floor and the opposing end frame rolls on tracks that are bolted to the floor, providing flexibility to accommodate varying payload lengths. 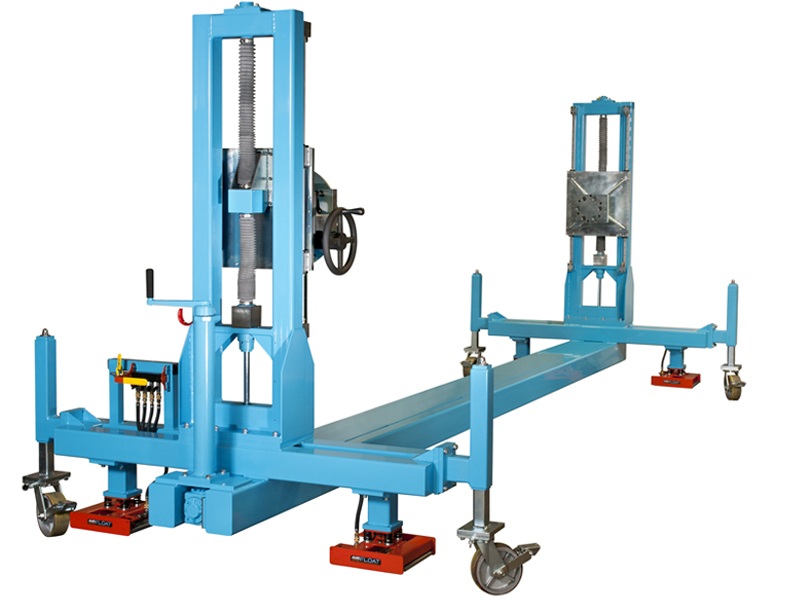 Custom cradles support the trunnion shafts in their lowest position during the payload loading and unloading process on this Flotron Lift Fixture. Flotron designed and implemented a mechanically synchronized lift system on this lift fixture. With a single input hand crank, an operator can ergonomically raise and lower a 2,000 lbs payload two feet. This 24” height change range is accomplished safely and without back-driving by incorporating redundant brakes in conjunction with ball screw lift jacks. Two carriage plates are guides vertically using precision linear guide bearing rails. 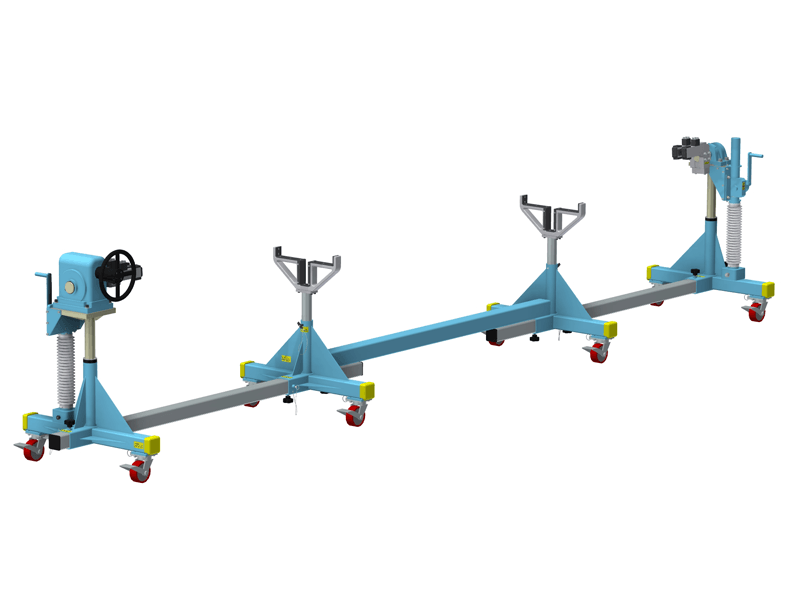 In addition to lifting functionality, this aerospace tool is a rollover dolly that provides 360 degrees of ergonomic rotation. 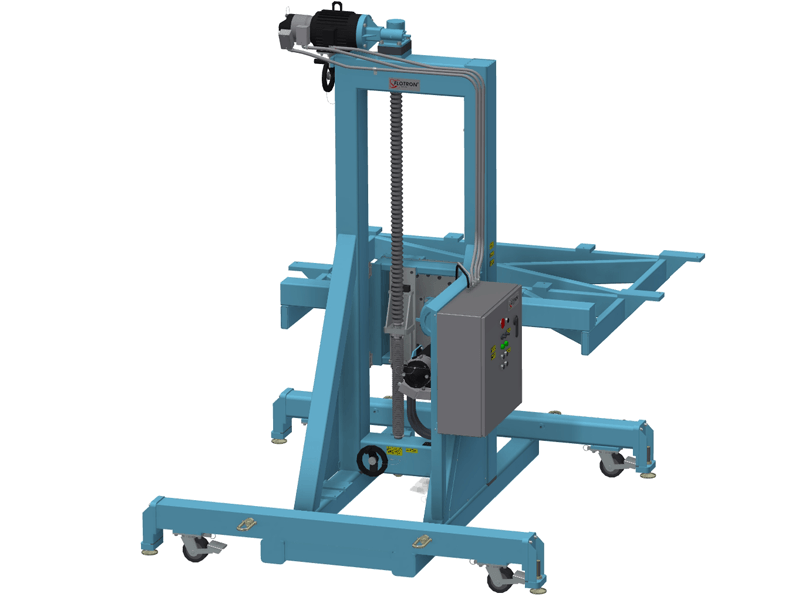 Flotron’s mechanically synchronized lift / rotate holding fixture is used to position various aircraft control surfaces at the appropriate height and orientation as the payloads travel through a series of automated drilling processes down a production line on air pallets. Flotron’s vertical lifting capability has served multiple purposes for our customers ground support equipment needs. In addition to accommodating various operator heights or positioning payloads at critical heights to perform various processes, Flotron’s engineered lift systems are used for vertical integration applications. In this particular case, Flotron incorporated high capacity, long-stroke lift jacks at the four corners of the rotation fixture end frames to lift the fixture (plus 4,000 lbs payload) 15 inches vertically to attach the payload to an overhead platform. Additionally, this Aerospace Tool offers ergonomic rotation to the technician for assembly, integration and test applications. 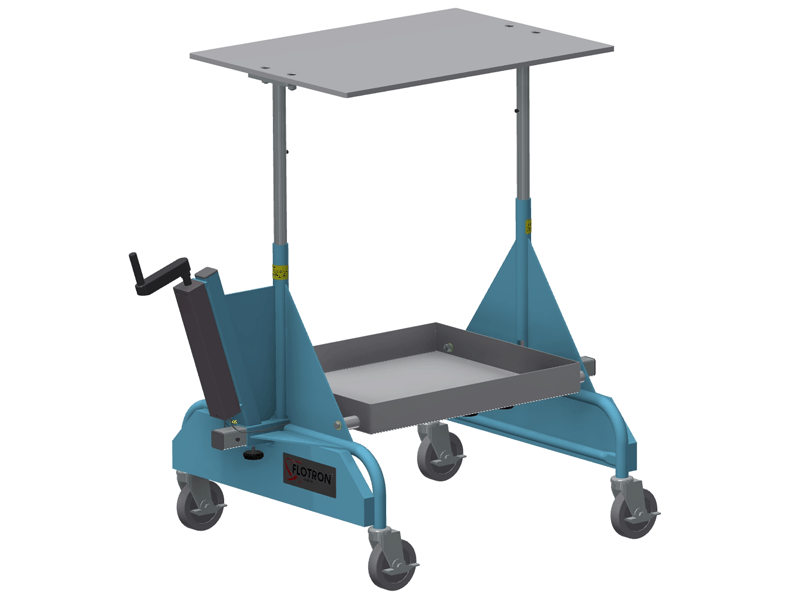 An air pallet system has been incorporated under each of the four lift jacks and transforms this tool into a transportation fixture to maneuver the fixture (with payload integrated) over sealed floor surfaces. Engineered electro-mechanical lift fixture capable of lifting and tilting a large panel stack to be offloaded for deployment. 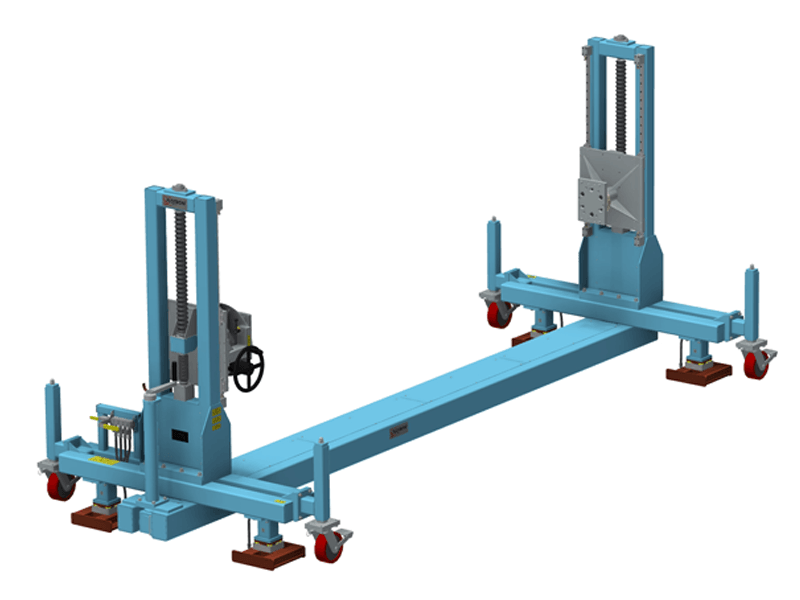 Engineered electro-mechanical lift fixture capable of lifting, pivoting and deploying a large panel stack. Asymmetric lift and rotation fixture capable of interfacing and lifting a complex geometry payload to improve safety and ergonomics. 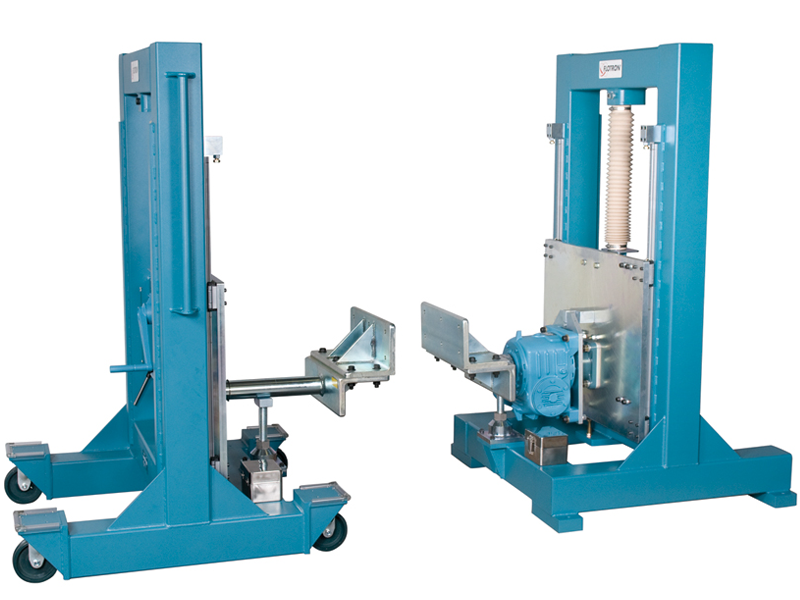 Synchronized mechanical lift and rotation fixture with 2,000 lbs. capacity and air bearing system designed to support an aircraft control surface during an automated drilling operation. Synchronized hydraulic lift platform with ballasted end frames to maintain stability. A drip pan catches and fluids during payload rotation.